The charming little Arakawa line is one of Tokyo's hidden gems. An old-fashioned tram, it snakes (very slowly) from around Waseda all through the shitamachi, before ending up Minowabashi. The trams themselves are a bit of a mishmash, with modern streetcars mixed in with adorable older models, all papered on the inside with advertisements that seem to have remained the same since late Showa. The tracks are tightly sandwiched between houses and shopping streets, the little free space often taken over by impromptu gardens of roses and hydrangeas. In short, a nostalgia buff's idea of heaven. After buying a cheap all-day pass (only 400 yen, yay! ), we jumped on near Ikebukuro and headed towards Sugamo. 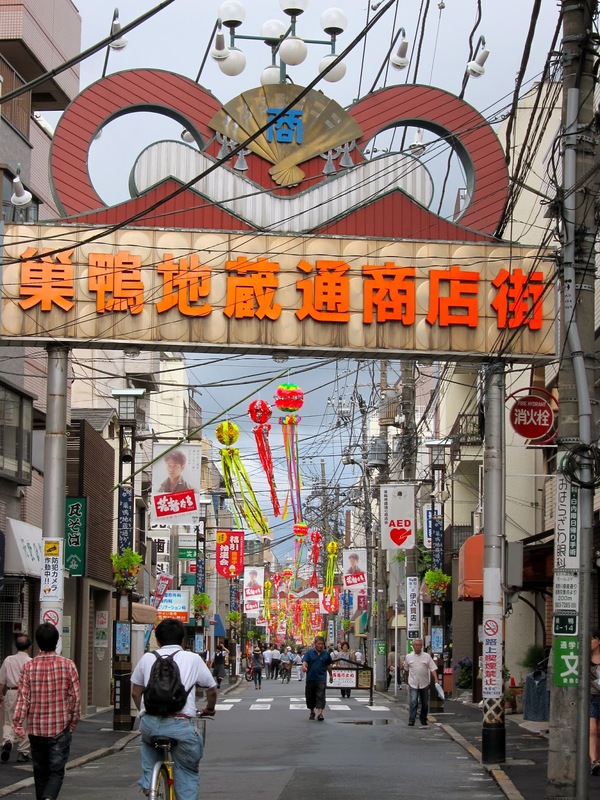 Sugamo also happens to be known as 'Grandma's Harajuku', with the average age appearing to be somewhere around 60-70. 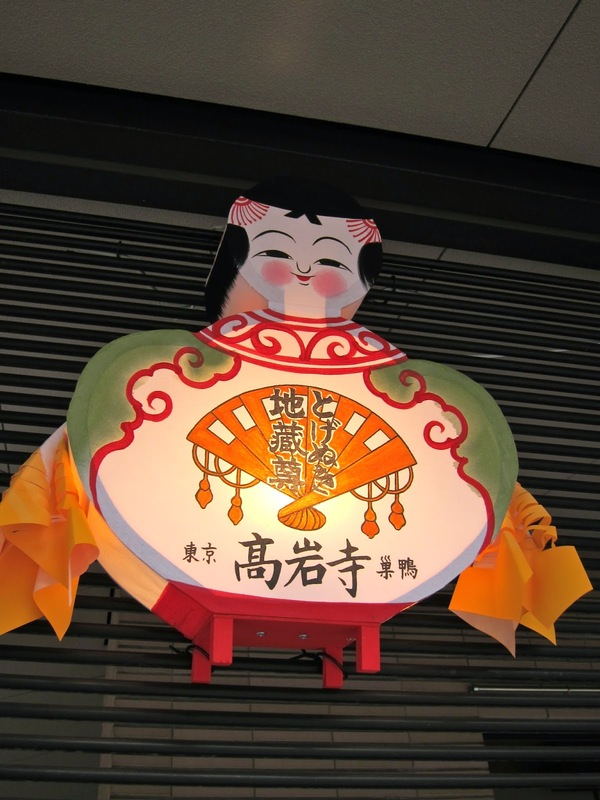 The long shopping street, which is quite close to Koshinzuka station, is well-stocked with tea, old-style breads and snacks, along with the famous shops purveying bright red underwear (said to promote health...by what means, I choose to not inquire). Our first stop, inspired by Matcha-kun's desire for coffee, was at a little wood paneled coffee shop, across from a crazy umbrella store. 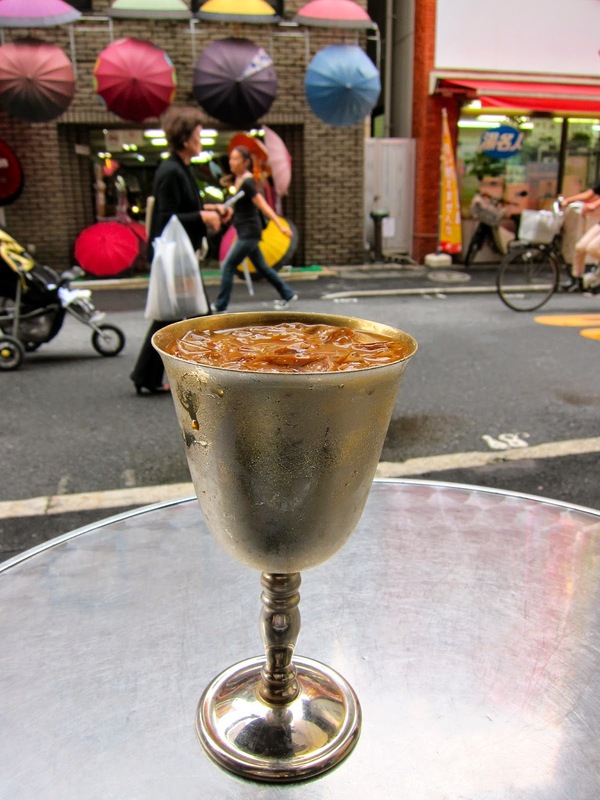 The iced coffee came in tall, brass goblets. Perhaps not the most convenient vessel, but certainly an entertaining one, ideal for proposing silly, caffeine-fueled toasts. After checking out Asukayama park, with its fanciful playground and fun concrete elephant, we headed back towards town (and dinner). 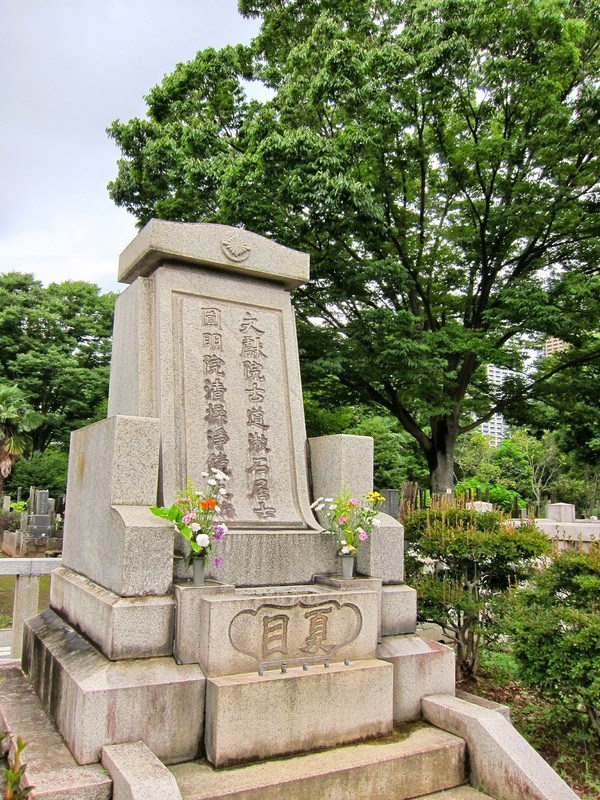 The final stop of the day was at Zoshigaya cemetery. Thanks to the tradition of cremation (ie. 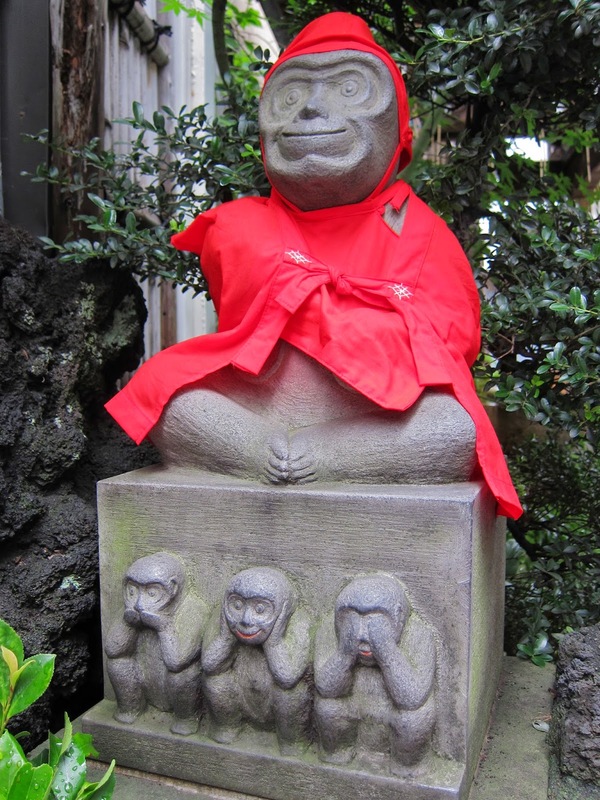 no zombies), Japanese cemeteries hold no fear for me, and in fact are a special favorite for walks, checking out unusual tombs and the giant cats that often populate them. While a whole bunch of famous historical figures are buried here, I cam looking for two in particular. 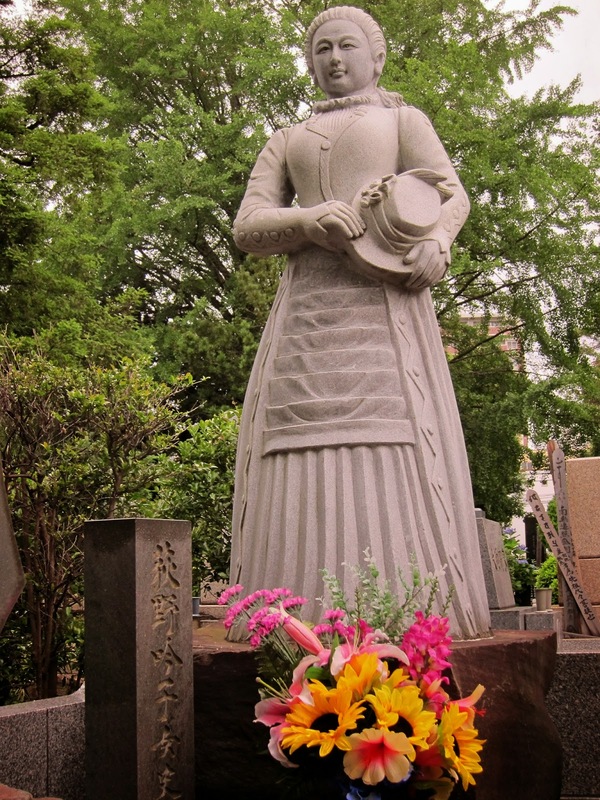 Ogino Ginko (the first female doctor in Japan) and Natsume Soseki (the famous writer). Sadly, despite checking maps and roaming back and forth, we couldn't find John Manjiro (one of the first Japanese people to visit the United States) whom Matcha-kun wished to visit... perhaps his spirit wasn't interested in guests right then?